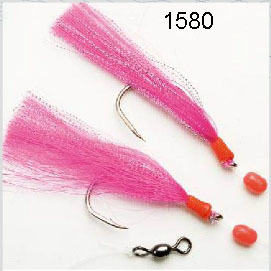 Pink flashing rig: This 2hook rig is especially designed for cod tied on 8/O hooks, mounted on 0.80mm mono. These are great when fished with a pirk at the bottom for gathering medium sized cod quickly. 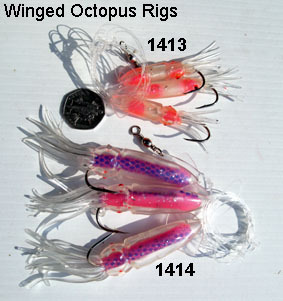 Winged Octopus / Squid Rigs: These come in two sizes, both are strung on 0.80 mm mono. The smaller 1413's are approximately 3" in length and are mounted on size 4/O hooks, 3 up with a 100lb swivel at the top of the trace. They are luminous and on a sunny day will self charge while on the boat. The larger 1414's are also mounted on 0.80mm mono 3 up on 8/O hooks, also with 100lb swivel at the head of the rig. These baits are around 6" in length and do tend to sort out the bigger cod. Once again these will charge themselves on a sunny day while on the boat but on very dull days or night fishing both rigs will need charging with a torch for maximum effect. 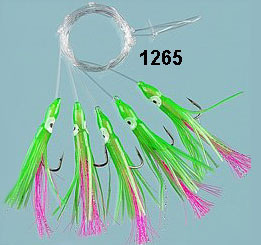 This is the wrecking version of the well known "daylight flash" mackerel feather. 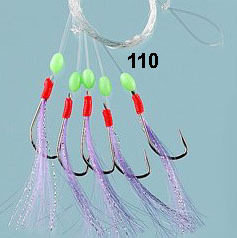 It is tied on 7/0 tinned O'Shaughnessy hooks with .08mm/60lb mono & is simply white tape with different colour heads. Sometimes "simple is best". Too big for the mackerel on the way down, so great when the sand eels are abundant. These are plastic "jet heads" on to which has been tied holographic film strips, which are clear but as you can see from the picture, refract every tiniest amount of light. 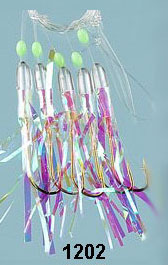 These are a must during spring & early summer when the "May rot" algal bloom is prevalent, when they produce the goods. purple angel hair & crystal flash on 7/0 tinned O'Shaughnessy hooks on 1mm/100lb mono.